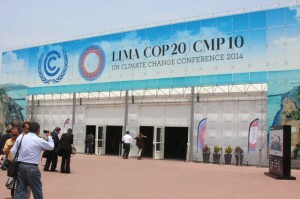 During early December 2014, negotiating teams from all nations of the world met in for two weeks Lima at the final Conference of Parties preparatory to the planned signing of a new climate agreement in Paris in 2015. The COP took place in a tent city erected by the host government, Peru. Peru relies on water from the Andes to provide half its energy and to irrigate the land that produces most of its agricultural crops. These same waters have fed civilisations here for more than 6,000 years. In the high Andes 200 glaciers have long provided steady, reliable supplies of water. Peru’s Quelccaya ice cap is the largest in the tropics. However, as a result of global warming the glaciers are in rapid retreat, and Quelccaya is melting at a rate of more than 180 meters a year. Current estimates are that the Peruvian glaciers will all be gone within the century, see Peruvian Glaciers for more information. 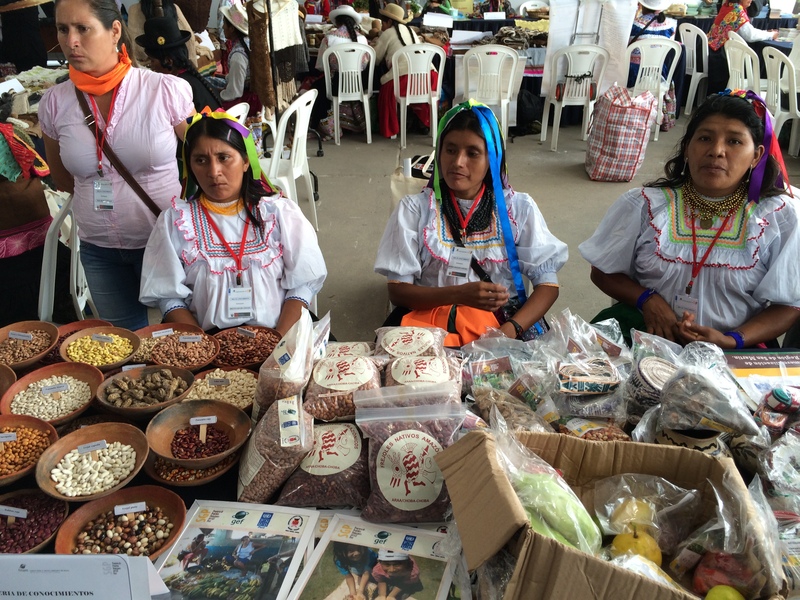 In this country so vulnerable to the impacts of climate change, reliance on fossil fuels is in the increase, and the fast-growing Peruvian economy depends on natural gas for half of its electrical energy. It also consumed 171,000 barrels of oil a day in 2013. It is ironic that the past 3 COPs (Durban, Doha and Warsaw) have also been held in countries with great appetites for fossil fuels and the contribution that they make to the national economy. 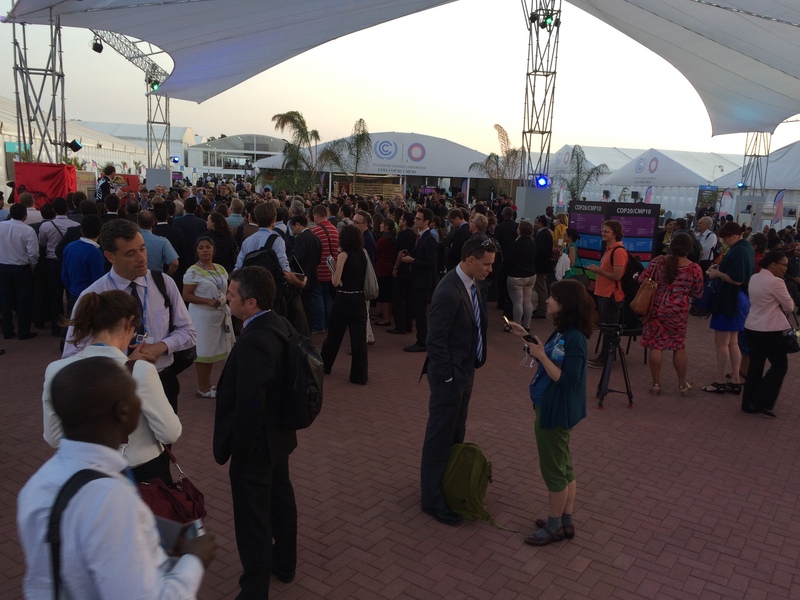 The cost of COP 20 in terms of finance and carbon emissions was enormous. As if to emphasise the fragile state of our global climate, the organisers housed the entire meeting in a “tent city” built on the grounds of a military base in the capital city of Lima. The same base is reputed to be the burial ground for over 1,000 Peruvians who were “disappeared” by the military during the regime’s war on the Marxist Shining Path (Sendero Luminoso) guerrilla movement. It was a strange place to hold a meeting intended to promote equitable access to security and advance the rights of all to environmental justice. The architecture of the tents that housed the COP was not intelligent: in a city that enjoys moderate temperatures as a result of the cooling Humboldt Current that runs along its coast, the tents trapped the hot air created by solar radiation and cut off the cooling breezes that circulated outside. Although the main meeting rooms were cooled by huge air conditioners, these were so noisy that participants had to put on headphones to hear what was being presented or discussed. In the lobbies and display areas there was no such comfort: temperatures soared to dangerous heights during the daytime. This was an apt metaphor for the entire enterprise: despite the construction of shelter and expenditure of energy to keep participants comfortable, we were trapped in a profoundly uncomfortable space. At a global level, that uncomfortable space is one in which our global community, faced with ever-more damning evidence of the human causes of rapid climate change, and of manifestations of its impact on society such as the recent tropical storm in the Philippines, seems incapable of taking the sorts of action that are needed to minimise the problem and fund promising solutions. South Africa is aware of the urgency of these negotiations, and the potential impact of failure on our people. In preparation for Lima, DEA hosted the National Climate Change Response Dialogue in November this year, and incorporated some of the views and priorities of participants into the national position. The South African negotiating team, led by Minister Edna Molewa, did its utmost to promote an equitable outcome that would enable humankind to limit the global warming that it is responsible for to 2 degrees. The delegation held meetings with all South Africans at the COP to exchange perspectives and to provide report-backs on progress. In her speech to the COP, Minister Molewa acknowledged the urgent need to address the global climate crisis now, and noted that we need to build on and enhance pre-2020 implementation, as already agreed in Durban, Doha and Warsaw. She referred to the science-based evidence of the Intergovernmental Panel on Climate Change (IPCC) 5th Assessment Report, noting that political will and commitment are needed to collectively raise the current pre-2020 levels of ambition, which are totally inadequate. She noted that the future legal arrangement to combat the climate crisis from 2020 onwards must be finalised in the 2015 Paris COP. 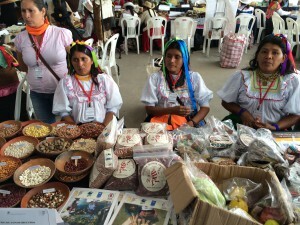 In Lima the Parties would have to build a political understanding of, and create the technical foundation for a future legal agreement that is inclusive, effective, fair and ambitious. 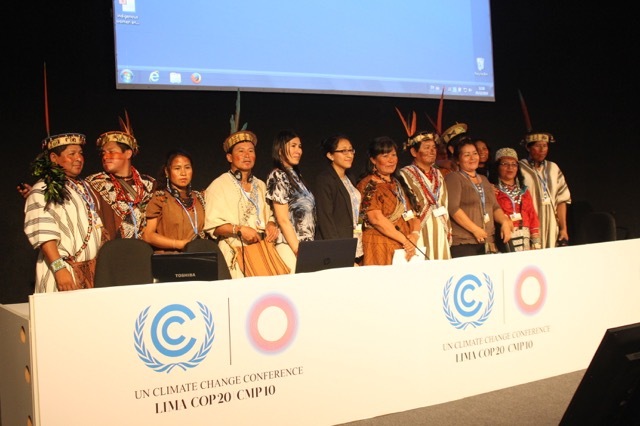 This foundation must include agreement on the information that Parties must provide with their post-2020 intended nationally determined contributions (INDCs), as the COP had previously agreed that these contributions should be communicated before the 2015 Paris COP. 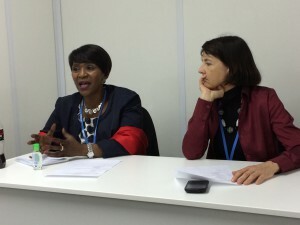 South African Ambassador to Peru, Nozipho Mxakato-Diseko (left) and Judy Beaumont, Head of Delegation (right) participating in the South African Delegation Meeting held on Thursday, 04 December 2014. The process leading up to the Paris agreement is one that must build on global political ambition to cut emissions, fund the adaptation to climate change that will be needed and also address the question of responsibility for the climate-induced losses and damage that are already being experienced by vulnerable communities. It has long been clear that this will all involve sacrifices and financial commitments, including banning damaging technologies and practices and investments in new technologies and energy sources. However, many of the major contributors to global warming have resisted committing to emissions reductions, and the wealthy nations have generally been unwilling to spell out how much funding they will commit, and when. 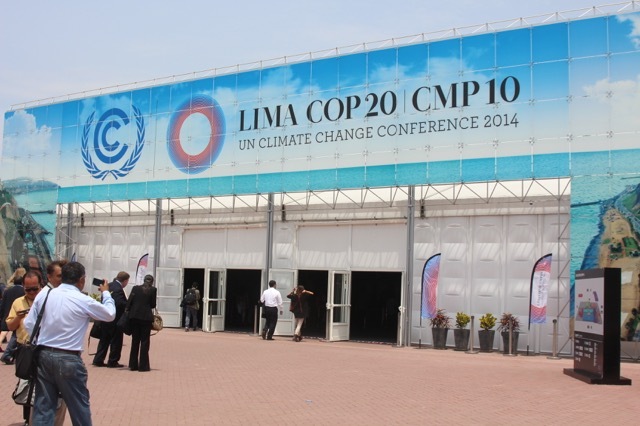 The Lima conference was intended to specify “contributions” by countries to addressing climate change. There was much debate about whether these “Intended Nationally Determined Contributions” or INDCs should be limited to mitigation only, or should also address adaptation and support in the form of finance, technology and capacity- building. The Africa Group and the G77 + China wanted to see commitments on adaptation included. Although the final text did make some concession to adaptation, the language merely reflected a “determination to strengthen adaptation action” in the Paris Agreement, which deflects attention from the actual decision, which focuses INDCs very clearly on mitigation. The powerful countries see the climate change deal being focused on mitigation and finance, and wont to see the developing countries also being forced to make commitments of this nature. The experience in Lima reconfirms that the interests of smaller countries are not taken seriously. While the COP was proceeding, a large number of Side Events were hosted to inform delegates of actions being undertaken in the context of climate change, or of its impacts on the natural world. Many of these provided valuable insight and access to information on the less obvious or accessible aspects of global climatic and atmospheric change. 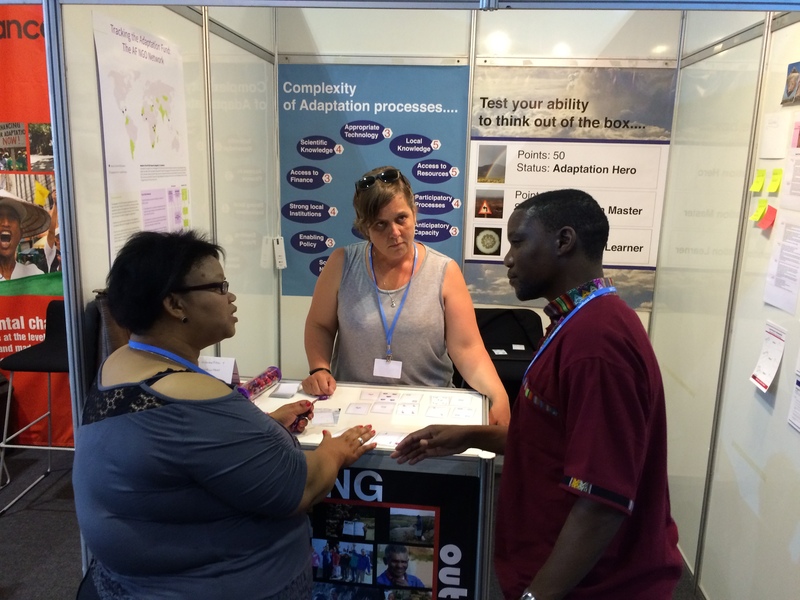 Bettina Koelle of Indigo and the Adaptation Network facilitated a Side Event with Adaptation Fund Board and the Adaptation Fund NGO Network, reflecting on the findings of a study recently completed on the implementation of the Adaptation Fund’s direct access modality in Africa. The event kicked off with an experiential learning exercise that demonstrated how negotiators need to have a vision of what they want to achieve, and need to make concessions in order to achieve it. 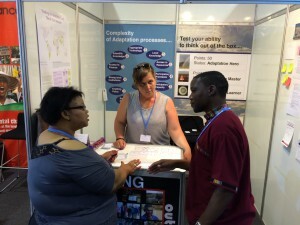 Read more on Adaptation Fund Reviews. For two weeks they talked. And when no agreement was reached after two weeks, they extended the talks for another two days. Despite all this effort, developed country governments failed to explain how they will deliver the long-promised US$100 billion per year in climate finance by 2020. Commitments of only US$10 billion have been made. No short-term commitments to cut emissions prior to 2020 were agreed to, and developed country governments insisted on completely removed any meaningful language about ‘loss and damage’ as a result of climate change. The Minister of Environmental Affairs, Mrs Edna Molewa arrived in Lima, Peru to participate in the twentieth session of the Conference of the Parties (COP 20). Minister Molewa in her speech to the COP noted that “there must be recognition that adaptation should be at the heart of the climate regime with multi-lateralism critical to offering protection of those that are most vulnerable”. The minister outlined South Africa’s plans, achievements and partnerships towards a lower carbon and climate resilient economy.